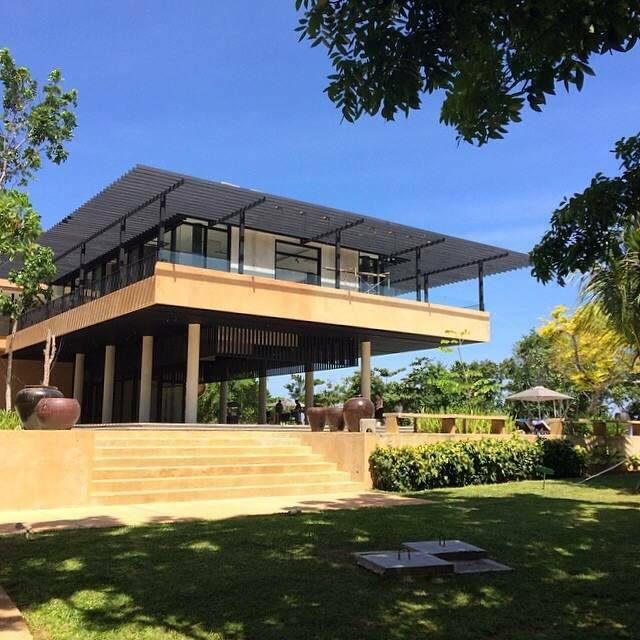 THE PICKIEST EATER IN THE WORLD: AIR ASIA AND AMORITA RESORT: A BOHOL NEW WORLD! AIR ASIA AND AMORITA RESORT: A BOHOL NEW WORLD! I've mentioned in the past that even though I lived in Cebu for quite some time as a child, I had never been able to visit the neighboring Bohol until I became a blogger. After a short visit in February of this year for the Ubi Festival, I had the fortunate opportunity to visit the beautiful "City of Friendship" once again, care of Air Asia and Amorita Resort in Panglao! Air Asia flies to Tagbilaran three times a day so you're bound to find a schedule that best suits you. After our plane trip, I was really quite spellbound by the beauty of the resort. It made great use of the existing lush greens, to compliment the structures that it built. Proudly run by Filipino owned One-Of Collection Group, the Hotel excellently pairs the heartwarming Pinoy hospitality with first rate service. I was billeted in a smaller room compared to my companions, however when you see the sheer size of the Amorita's Junior Suite, a couple, or even a family of three will have all the space that they need. As you enter the room, the first thing you will notice is the "Parlor", which features the sink, boudoir and dressing area. A couple of steps away, reveals the spacious bedroom, that is fitted with an incredibly fluffly King Sized Bed, and Bamboo Speaker for your iPod. Though I must admit I was a tad bit envious of the Balcony that my friends had that was equipped with a Bath Tub, I did enjoy the charming day bed that was sitting by the lovely picture window of the room, giving me a glimpse of the common area of the Amorita. The room is also equipped with a flat screen TV and a coffee table, making dining in your room not a problem. But truthfully, who goes to Bohol to stay in their room, right? Especially when you have a spectacular Swimming Pool, to go along with awesome facilties around the picturesque resort. The Pool includes a Children's area that is only 2 feet deep, making it a fun places for people of all ages to enjoy a day of swimming in! The Poolside is an awesome place to hang out, giving you a clear view of the beach in front of you.. Perfect for lounging around on a sunny day! Here's a quick Facebook Live video of my walk around the pool area, including a glimpse of the Swimming Pool's viewing deck! There are Bicycles for rent should you wish to take a ride around Panglao..
Or you can opt to hit the beach for some Kayaking, Paddle Boarding and Island Hopping! Oh and word of advice. If you ever find yourself going island hoping with Victor Basa, never stand next to him when you're both shirtless. Whether back or front, there's no way you're gonna good. If you're looking to relax, there Amorita's Sea Tree Spa has got your covered. Guests who would like to book a massage, may choose to do so in the privacy of their own room, or at the Sea Tree Spa itself. I've had the pleasure of dining at roughly around five resort restaurants in Bohol, and I can safely say without bias that I enjoyed Amorita's food the most. Amorita has two restaurants for you to dine in, with Saffron Restaurant being their flagship cafe, and Tomar Tapas X Bar. Upon arrival at Amorita, I made a beeline for Saffron, which offered an all day ala carte menu, as well as Breakfast and Dinner Buffet. A favorite of the group was the deconstructed Pork Binagoongan dish. The freshness in the ingredients were undeniable. The Baby Back Ribs were fall off the bone tender, and had a gorgeous smokiness that tantalized my palate. The Chicken Binakol was also executed masterfully, with the gorgeous play of flavors. The hit of the meal was Saffron's take on Turon. These deep fried Banana Spring Rolls, filled with a Jackfruit slice and homemade crumbled Chocolate Peanut Kisses (A Bohol Staple), It is then drizzled in a delectable Salted Caramel syrup. You can enjoy it with a scoop of their home made ice cream, but honestly, it's good to go in its own. For dinner, we were treated to an incredible dinner spread, that included some local favorites, as well as some popular international items. Some of the highlights were the Pork Humba, and the Pinakbet. Pinakbet is one of the few vegetable based dishes that I'm ok with, since I seem to enjoy anything with Coconut Milk. The Fish and Chips were fried to a glorious golden crisp, while the Crispy Wings were remarkably flavorful! For Dessert, Saffron offers a selection of fresh fruits as, well as Mango Sago and assorted Pastries. For me, any good Breakfast Buffet worth its weight will always have bacon in it, and Amorita's bacon is pretty awesome. Streaky and cooked just right, letting out a nice crack with every bite. Other breakfast hits were the delicious Longganiza..
And Ham slices that had bits of Mango minced into it, giving it a delightful sweetness. They customized Eggs to your liking. Cold Cuts and Bread Station. Apart from enjoying the splendors of Bohol's beauty, part of our agenda was to attend the Launch of the partnership of Sunnies Sunglasses and Air Asia at Amorita's Tomar Tapas X Bar. I swear, I must have eaten 20 pcs of the Croquetas con Jamon. I'm sure Rina would have loved the Croquetas con Gambas version. The Paella Valencia was moist and flavorful. I'm quite particular with my Paella's but this one passed my standards with flying colors. Spring is definitely in the air, as Air Asia unveiled that their in flight catalogue now includes a selection of Sunnie's Glasses! Perfect for people like me that often forget to bring their shades during trips, and need stylish yet affordable choices. What made this even more special was that I able to experience Bohol with some of my dearest friends from the KTG, such as Yen Dreyfus aka The Tummy Traveler, as well as Jill Bantang aka the Food Scout! Apart from that, i was able to meet some lovely new friends in Travel Bloggers Sting Like Abi, The Jovial Wanderer and Nina Wanders..
And the beautiful Catriona Gray! I must confess, I totally fell in love with everything about Amorita Resort. The accommodations and facilities are world class, the food is first rate and the service is top notch. I would have no hesitation in recommending Amorita Resort to anyone who asks for suggestions on where to stay when in Bohol! MAKE YOUR VOICE HEARD.. THE CHOICE 2016! OUR BELMONT HOTEL MANILA STAYCATION! CREAMY ADOBO WITH NESTLE ALL PURPOSE CREAM! OUTBACK STEAKHOUSE MAKES A MOVE TO EASTWOOD CITY!